Caelan Dorris (left), Harry Byrne (centre) and Michael Silvester (right). Ireland get their U20 World Championship campaign underway in Perpignan tonight with a daunting clash against hosts France. Noel McNamara's youngsters ran the French close during the Six Nations, before going down by ten points. 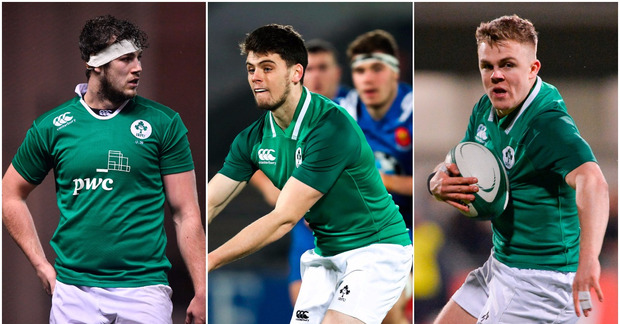 The annual underage tournament is a great showcase for the best emerging talent in the world, and Ireland have plenty of quality in their ranks this year. Here are five players to keep an eye out for over the next two weeks. The Ballina native made his name as a schoolboy sensation with Blackrock College and is seen as the next great back row prospect at Leinster. Doris captains the side at number eight and will want to make up for lost time after missing the entire Six Nations with a hamstring injury. Keep an eye out for his explosive ball carrying and his unique ability to free his hands in contact. Likely to have a big future in professional rugby. A fullback whose running lines from deep punched numerous holes in opposition defences during the Six Nations, Silvester is Ireland's sharpest attacking threat in the backline. The former Clongowes pupil got better with each game in the spring and should relish the hard ground in France. Silvester is currently in the Leinster sub-academy but will hope that a strong showing at the world championships will boost his professional prospects. Another out-half who has not only come out of St Michael's College, but from the Byrne family. Harry's brother Ross has been excelling for Leinster this season but will soon have competition from his family dinner table as his younger brother continues to develop. Byrne is already a strong goalkicker and passer, and his performance will be crucial to any Ireland success this month. The all-action tighthead prop is the leading light from the rugby boom that has occurred at St Fintan's in Sutton over the last number of years. His scrummaging will be tested massively against France but Aungier already looks to be in the mould of the modern tighthead prop, who can mix strong carrying with solid set-piece work. O'Sullivan is versatile, having also played fullback, which gives him an added threat as the Ireland number nine. Needs to quicken up his pass a fraction but worked well with Byrne when they were paired together during the Six Nations. After a decorated schools rugby career with Belvedere College, big things are expected of O'Sullivan over the next few years.